So! Today I looked up a youtube video on Figure 8 cast on. Not hard! Very fun! Then I started on the toe. I have to say that I may be a convert to circulars for socks. It has been so much fun so far. I’d tried this technique, believe it or not, on the very first pair of socks I knitted. Well, they didn’t actually get knitted, because I could not figure out how to do the heel with the circulars. I had never knit a heel before though, so I could not use any kind of sock intuition to help me through it. Now though, I’ve knitted enough socks to be able to, so far anyway, figure out where I need to go. I can see why people like this technique. The two circulars are really a lot easier to manage at the beginning of the sock when I haven’t knitted many rows, and it’s all kind of flopping around on me. 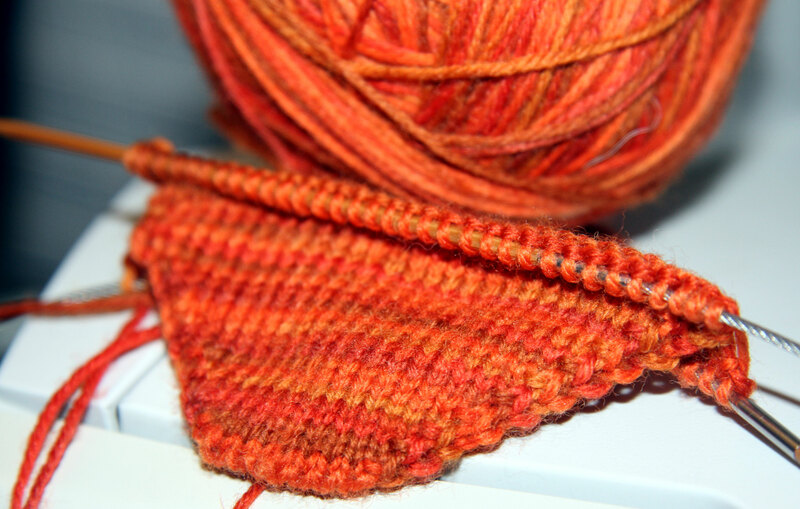 I can definitely see myself always using 2 circulars for toe up socks rather than dpns. It was much easier for me to get a nicer looking toe than it would have been with the double pointed needles. This pattern is called “Make up Sox”. It’s got this climbing vine pattern on it that may eat my lunch. It involves some kind of bobble like things, cables and following a chart. If it is not a color chart, then I tend to have difficulties. And when I do get to that heel, I may be in trouble. So Davey and I hung around here all day today. He likes to say, “Mommy, will you come in here (his room) and knit while I pack for ‘school’?” Of course I never refuse an invitation to knit. So I watch as he empties enormous bins of toys in preparation for school. I ask him how in the world he plans to get all that stuff to school. “I have a truck, Mommy.” ahhhh. Here’s how it kinda looks on circular needles rather than dpns. So far so fun! I’m so proud of you! That toe looks perfect. We’ll get together for knitting one of these days, I just know it. I gave up my dpns when I first tried the 2-circular method for socks. It just seems easier and more flowing for me, without all the pushing the stitches around that I was irritated by with the magic loop method. 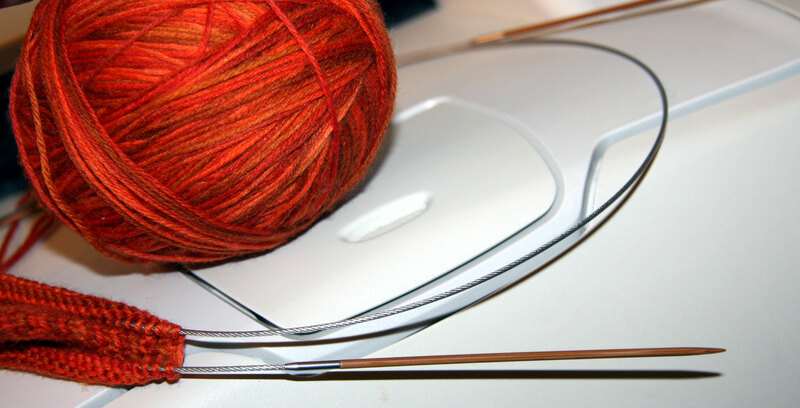 I also find that I’m much less prone to stitches falling off the needles this way, especially when I carry the project around with me.